I make homemade granola quite frequently; we go through a lot of it in my home. This has been my “go-to” recipe for a while, but when I picked up some organic dried persimmons recently, I decided to try them in an adapted version of this granola recipe from Saveur. One thing I have noticed in the past is that when you bake granola with dried fruit in it, the fruit tends to get really hard. Crunchy oats are a good thing, but crunchy fruit? Not so much. Of course you could mix in the dried fruit after baking, but I decided to try something else this time: baking the granola at a very low temperature. I’ve been wanting to make granola like this for a while because nutrients like enzymes are better preserved when they aren’t cooked over high heat. That’s why raw foods are good for you. This isn’t technically a “raw” granola, though; for it to be considered raw, it would have to be prepared in a dehydrator at 115°F….maybe I will try that next time. I was happily surprised that when baked at 150°F for about eight hours (I baked it overnight), the dried fruit stayed tender, and the granola became pleasantly chewy (rather than super crisp). I love all the flavors in here and think they are terrific together, but feel free to swap out any of the elements as you see fit. You could use cashews, almonds, or walnuts, etc. instead of the pistachios and you could throw in raisins or whatever dried fruit you have on hand (use unsweetened, organic dried fruit with no preservatives, if possible) instead of the persimmon (I know it’s not easy to find). Organic coconut oil could be used instead of the olive oil and maple syrup could be used instead of the honey, if you prefer. If you don’t want to spend hours baking your granola, then go ahead and bake it at 300°F for 30-40 minutes, stirring it mid-way through. You could also compromise and bake it at 200 or 250°F. I am not sure how long it would take- about 1.5-2 hours, I imagine- so do keep your eye on it. Serve your granola with milk (I drink organic raw milk, but you can substitute your favorite milk alternative, if you like) or yogurt and fresh fruit, or eat alone as a snack. 1. Preheat oven to 150°F (if your oven can't be set that low, use the lowest setting possible). Line two large baking sheets with parchment paper. 2. Mix oats through ginger in a large bowl. 3. Warm the olive oil with the honey over very low heat. Stir to combine, then pour over the dry mixture and mix thoroughly. Spread the granola evenly over the two pans. 4. Bake for 8 hours, or until the granola is golden brown and done to your liking (alternatively, you can bake it at 300°F for 30-40 minutes). You can keep this in an airtight container at room temperature for several weeks; place in the refrigerator or freezer for longer term storage. Mmm, I love granola–especially homemade! This looks great, Winnie! 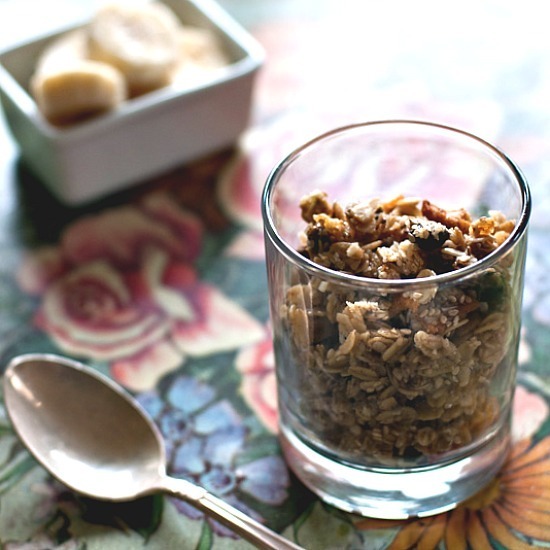 I love homemade granola too – it is a treat I love to sprinkle on my greek yogurt! With Greek yogurt is how I eat it, too! That’s sounds like a wonderful combination. When I make granola, I never bake the fruit but rather add it in once the oats/nuts are baked and cooled, so as to avoid the hard fruit problem. Does it improve the flavor to bake the fruit along with everything else? I don’t think so Sophie. You can really do it either way. SHEER GENIUS. Winnie – this is gorgeous! I always love new a creative granola recipes, so thank you for this one. I have never used persimmon before, so looking forward to trying it. I love this idea! I am a big fan of both pistachios and persimmons, and I would not mind the long baking at all. I am going to give this a try! I’ve never been brave enough to use olive oil on granola, but apparently it works. I’m going to start looking for those dried persimmons and give this recipe a try although I will bake it at a higher temperature because I don’t have the patience for long bakes. -:) Thanks for the recipe! The higher temp is just fine- hope you can find the dried persimmon- it’s worth it! I feel a bit like I’m at a twelve step program because I am called to admit. I can not stop eating homemade granola. Ever since I started making my own, I look forward to breakfast more than I have in years. Yogurt, some granola and a bit of fresh fruit? Heaven. I’m not sure I have EVER seen persimmons though…but am intrigued by the low slow cooking because I do add any dried fruit at the end. My only concern? The amount of power for that overnight bake; I am so conscious of conserving energy I fear that would have me a bit of a wreck! 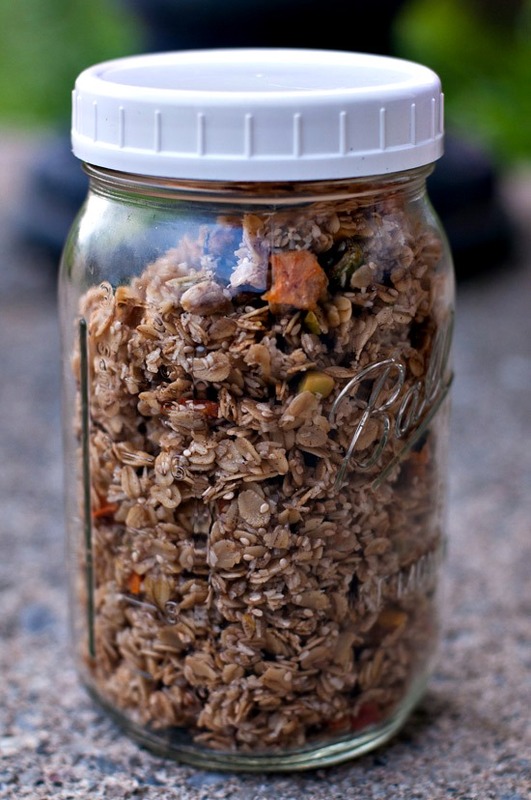 I just love homemade granola… This is a recipe I will have to try! 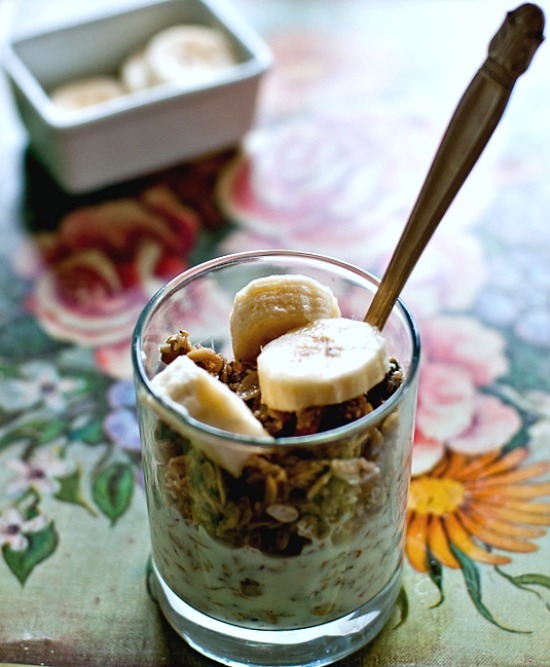 I’ve been having quite the love affair with granola lately too! And I love adding new and interesting things to it! Where did you get the cool lid for your canning jar?